What is the Shieldaig Sea Trout Project? The Shieldaig Sea Trout Project is a fisheries project run by the Scottish Executive's fisheries research agency, FRS, and arose from widespread concerns about declining stocks of sea trout and some salmon populations in the West Highlands and Outer Islands . The sea trout is a sea going or anadromous form of the brown trout. Like salmon the fish spends its juvenile stages in freshwater and migrates to sea to feed before returning to over winter as finnock or breed as mature adults. The runs of returning adults and finnock have supported locally economically important fisheries in NW Scotland. The decline in sea trout numbers has led to a substantial drop in the numbers of visiting anglers, with serious consequences for many rural areas. The aim of the Shieldaig Sea Trout Project is to examine why there has been a collapse in sea trout and to find ways to help restore them to their former abundance. 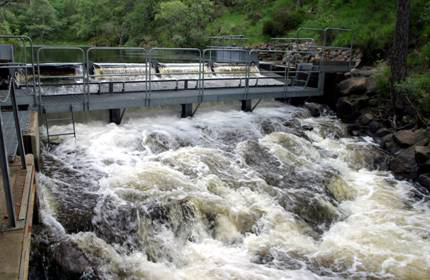 The Shieldaig Sea Trout Project provides for the first time in West Highland river secure information on a sea trout population by examining stocks passing through a two-way trap situated near the River Shieldaig estuary. The Shieldaig trap has been in operation since the spring of 1999. Each spring we capture and tag approximately 1500 sea trout smolts .This allows us to make estimates of marine survival when the surviving fish return at the end of the summer. A restocking programme has been in place since 1997. Currently we stock the Shieldaig River with eggs from captive native Shieldaig brood fish, supplemented with ova from fish from a neighbouring catchment. The trap forms an integral part of monitoring the success of any restoration methods. Much of the work centres on the relationship between sea trout and a marine parasite called the salmon louse. This louse is a common parasite of both wild and farmed salmonids. 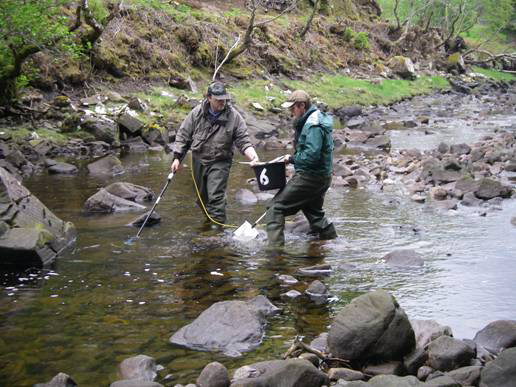 Biologists work very closely with local wild fishery proprietors and fish farming companies through the Torridon Area Management Group to ensure that the health and survival of wild fish are maximised. Recent years have demonstrated that minimising planktonic sea lice levels leads to a considerable improvement in marine survival of sea trout smolts. However increases in planktonic lice levels and a consequent decrease in marine survival in summer 2007 has demonstrated the fragility of the situation. The work at Shieldaig has contributed much to our knowledge of natural and abiotic factors affecting sea trout populations, particularly the close relationship between fish farm lice levels and shoreline densities of infective juvenile lice. Shieldaig has become the focus of a number of FRS scientific studies researching various elements of sea louse biology. The future focus of the Sea Trout Project will be mainly restoration whilst maintaining ongoing lice studies and monitoring of juvenile fish populations. In April 2000, an interpretation centre was opened as part of the project. The centre describes the sea trout life history and the recent population decline in western Scotland . In addition, the display boards explain the nature of the Shieldaig Sea Trout Project and the scientific work used to study sea trout and to examine ways of restoring their numbers at Shieldaig. There are also interactive displays for young children that teach them about the life cycle of the sea trout, their predators and prey, through a series of games. You can also find up to date information about the project and other local environmental issues such as seals and sea lice. Publications regarding Scottish fishery issues and reports from fishery trusts are available for reference. An annual project report outlining the progress of the Shieldaig project is available from the visitor centre. If you cannot get to see us please download our annual report (details below).